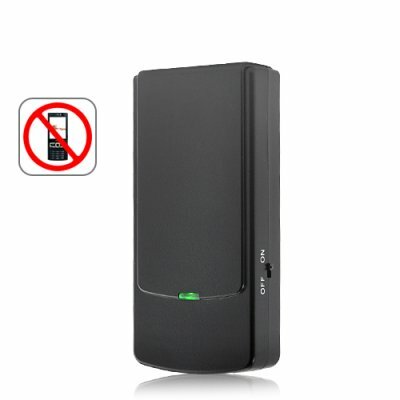 Successfully Added Phone No More - Mini Wireless Cellphone Signal Jammer (GSM, 3G, DCS, CDMA) to your Shopping Cart. An awesome mini wireless cellphone jammer -- that deceptively comes in the shape of a cellphone! Not only is it effective at shutting down GSM and 3G cellphone signals - it even eliminates older CDMA and DCS mobile phones for silence all around, all the time! The Phone No More full spectrum cellphone jammer transmits low power radio signals to cut off communications between cell towers and any cell phones in the proximity. It does not interfere with anything other than mobile phones within a 10 meter working radius! What types of cellphones will it disrupt? And the instant you turn this jammer off, all cellphones will automatically re-establish communications and provide full service. Brought to you by the China wholesale dropship electronics leaders - Chinavasion. Effectively shuts up loud cellphone users in public places! How could this jammer possibly disrupt 3G cell phone signals when the 3G frequency of 2100 MHz falls outside of The Cellbuster's affected frequency range of 2110-2170MHz range? Though 3G cellphones reportedly operate at 2100 MHz, the number has actually been rounded down for the sake of convenience in the same way PI does not equal exactly 3.14. In reality, 3G cellphones operate within the 2100-2170MHz range and as a result The Phone No More definitely disrupts 3G mobile phone signals. Does this mobile phone jammer pose any health risk issues? on 2011-09-05 03:50:51 Very nice, but with a WARNING! The product works like a charm. Does as advertised, and even better! As a physics teacher, I really love is. BUT as a diabetic, I am concerned about it. I have an Insulin pump and I use a remote to control the pump as well as a glucose sensor, both communicate on the 900 MHz frequency and do get blocked by this jammer (and I think all others whom block that frequency). So, medical devices can be inflected with is product. BE CAREFULL! on 2011-08-11 03:01:45 Excellent product with best price! Good quality. GSM jamming is perfect. First, it was by far the best price I found and it arrived only a few days after my order. It's small, light and fairly powerful considering how compact it is. It effectively shut down every cell phone in my entire house. I can't wait to test it out in a movie theater.